While much attention has focused on Burkina’s north and, more recently, east, insecurity has been brewing in the country’s southwestern regions, bordering the Ivory Coast, Mali, and Ghana. In the aftermath of several high-profile attacks in the capital city of Ouagadougou between 2016 and 2018, events in the landlocked West African country of Burkina Faso have gained more attention (ACLED, 2018). Particularly of note has been an encroaching insurgency in the country’s north, (CTC, 2018), largely driven by the domestic militant group Ansaroul Islam in tandem with or as part of Jama’ah Nusrat al-Islam wal-Muslimin (JNIM) and Islamic State in the Greater Sahara (ISGS). Since late 2016 until present, violence in the north has displaced 54,000 people (ECHO, 2019), destabilized the local economy, and forced the closure of nearly 800 schools (OCHA, 2018). 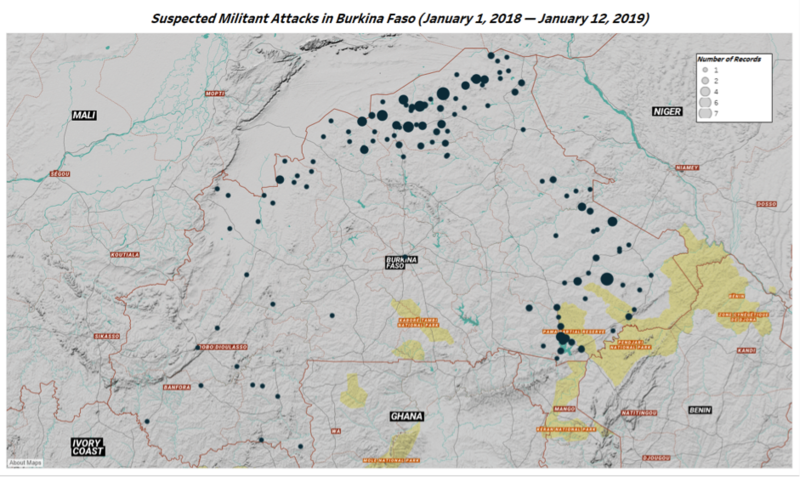 In 2018, ACLED recorded nearly 200 suspected militant attacks in Burkina Faso (see map below). When observing the spread of militancy in Western Sahel, three phases of an expansion southward can be clearly distinguished. The first in early 2015 with the spread of the insurgency from northern to central Mali, driven by Katiba Macina. In late 2016, a second phase began in northern Burkina Faso and western Niger, respectively, assumed by Ansaroul Islam and ISGS. And currently the third phase: set in motion in February 2018 with the implantation of militants in the Est Region of Burkina and nearby areas including Torodi in neighboring Niger where elements of all groups converge, reflecting JNIM’s endeavour to deepen cooperation and unify militants. The expansion southward may as well be an effort seeking to overstretch French counter-terrorism forces in the region and to complicate the operationalization of the G5 Sahel Force, in which Burkina Faso is a participant. This spread is particularly relevant to Burkina Faso, occuring at a pace that the government has serious difficulties coping with. New fronts are opening up before authorities, defence, and security forces are able to adequately address previous ones. Since February 2018, attention has shifted from the north to the east, where ISGS, Ansaroul Islam, and JNIM militants have implanted themselves, allying with pre-existing criminal networks. The militants have certainly established their modus vivendi and hegemonized it, enjoying significant freedom of movement, overtly controlling artisanal gold mining sites and occupying territory—running hours-long fake checkpoints to conduct identity checks in search for military and security personnel, and state employees (Actu Burkina, 2018). At the Kabonga mining site in the Pama Reserve, militants have begun implementing sharia-style rules, prohibited smoking and music, and torched bars and huts harboring prostitutes. In the village of Naloanga, militants summoned villagers for prayer and ordered them to stop brewing and consuming Dolo, a traditional beer (Netafrique, 2018). Notable is how rapidly the east has been dragged into chaos, the frequency of attacks totalling 60 according to data collected by ACLED (see map below), and the systematic approach of the militants (ACLED, 2018), suggesting an increased strategic and tactical maturity, in addition to a robust local support network. The spread of the insurgency has weakened the government’s already-tenuous hold in the region. For instance,the Kabonga site witnessed a landslide in late October, burying an unknown number of people estimated to be between 50 to 100 individuals (Radio Omega, 2018). Months later, authorities and FDS (defence and security forces) have still not been able to conduct rescue operations or to enter the site; the only measures taken are that the air force has flown reconnaissance missions over the area. In Burkina Faso, only a small fraction of the attacks attributed to militants are claimed (The Intercept, 2018). However, JNIM advertised its presence in the Est Region when it, in late December, claimed responsibility for a complex ambush and an IED attack (Menastream, 2018)—in connection with claiming a deadly dual-ambush near Toéni on the border with Mali (Long War Journal, 2018). These claims came almost a year after the localized insurgency in the east was launched, the delay in announcing suggesting that the militant organization’s public messaging is informed by strategic considerations, refraining from trumpeting its presence before being efficiently entrenched. Out of nearly 200 suspected militant attacks in 2018, JNIM chose to claim responsibility for three particularly lethal attacks. Highlighting this, JNIM is the mind behind the operation and has the tradecraft for managing the regional insurgency, while ISGS and Ansaroul Islam run their more localized enterprises. However, all three are interconnected and share objectives and adversaries. In recent months, insecurity has been brewing in the country’s southwestern regions, bordering Ivory Coast, Mali, and Ghana. In the wake of a recent attack on December 11, 2018, in Bouroum-Bouroum, Poni Province (Sud-Ouest Region), Burkinabe state media reported that gunmen deployed heavy fire while attacking the police station, setting ablaze buildings and motorcycles, and chanting Allahu Akbar. However, no casualties were recorded (AIB, 2018). On January 7, 2019, Dozos in Trimbio, Poni Province (Sud-Ouest Region) clashed with a group of alleged jihadists aboard motorbikes. In the course of the attack—the jihadists were routed and one sustained injuries following an exchange of gunfire (Bafuji, 2019); they also left behind motorbikes, AK rifles, magazines, ammunition, tactical vests, and a black bandana with the shahada, the Muslim declaration of faith (Wat FM, 2019). On January 12, 2019, a police unit was dispatched to the village of Nafona in the Comoé Province in order to execute a court order related to a land dispute; opposed by defiant locals, the policemen shot dead a woman amid the tumult that broke out; a mob of villagers then lynched two of the policemen to death. The land dispute was an unsettled affair between two old friends that dated several years back (MinuteBf, 2019); however, two days later, an armed assault targeted the border police station in neighboring Yendéré near the border with Ivory Coast. The assailants torched a vehicle and a motorbike while the facility and other vehicles were left riddled with bullets. Local authorities confirmed that the assailants were jihadists and shouted Islamic battle cries during the assault (Infowakat, 2019). While Islamist militants have a tendency to exploit local issues such as land disputes, there is no indication that the events in Nafona and Yendéré are connected; rather, militants seized the opportunity to attack amid local instability and potential confusion among security forces. Burkina Faso has, since its independence, increasingly been facing modern security problems, including organized and transborder crime, and urban and rural banditry. Armed bandits or highwaymen have straddled the borders between Burkina Faso, Ivory Coast, Ghana, and Mali for years. However, since August 2018, this violence has taken on new and significant characteristics. Since then, there have been repeated attacks against fixed positions and patrols of the police, gendarmerie and customs — a notable shift from the past, when violence was limited to banditry. In fewer than five months, there have been ten such attacks, resulting in three reported fatalities, eight injuries, and substantial material damages to the facilities (see map below). The targets and modus operandi taken into consideration render it unlikely that this is solely related to banditry. While armed bandits benefit from the weakening of security forces, their incentives for perpetrating such actions are limited. Contrarily, a broader trend in the subregion suggests a solidifying nexus between militancy and banditry which could be translated into “jihadization of banditry”, an alliance of convenience with mutual benefits. Militants may co-opt existing criminal networks by providing more advanced and heavy weaponry and hard currency in order to make inroads where they have a limited support base and presence. This will consequently expand their areas of operations, whereas armed bandits may provide manpower and logistic support, enabling the implantation of militant groups on relatively unexplored territory. From the perspective of armed bandits, rallying militant Islamist groups could also serve as a means to “morally” justify plundering and pillaging as part of a greater “cause”. In Burkina’s southwestern regions, the physical environment and coverage provide points of refuge; nevertheless, the societies of the three regions concerned vary. Each are respectively dominated by the Lobi, Senoufo, and Bobo ethnic groups. The Sud-Ouest Region has the lowest proportion of Muslim residents (12.9%) in Burkina, the majority (64.9%) following local religions, followed by Catholics (17.7%) (INSD, 2015, p. 16); this may make it difficult for Islamist militants to operate overtly. In contrast, Islamists may find it easier to cultivate relationships with the local population in the neighboring regions of Cascades (where 76.6% of the population is Muslim) (Ceped, 2016, p. 40) and Haut-Bassins (72.3%) (INSD, 2015, p. 15). Demographics aside, the socioeconomic characteristics and extent of a state security presence will also shape the capacity of jihadist militants to operate in these areas. Bobo-Dioulasso, the regional capital of the Haut-Bassins Region is Burkina’s second largest city, harboring a substantial presence of FDS, including the 210 Air Base, whereas the remoteness and relatively weaker presence in the Sud-Ouest could be to the advantage of militants. In November, Burkinabe, Ivorian, and Ghanaian forces conducted a week-long tripartite transborder operation monickered “Koundalgou II”, the final outcome of the operation was 150 suspected criminals arrested, including 15 on Burkinabe territory, vehicles, equipment, and contraband seized (Le Faso, 2018). The operations are designed to pool resources in order to more effectively improve security in border areas; however, the short and long-term effects would be dependant on the continuation and frequency of such joint efforts. Moreover, the Human Development Index (HDI) is significantly lower for the Sud-Ouest compared with Haut-Bassins and Cascades (Global Data Lab, 2018). In fact, the Sud-Ouest’s HDI ranking is the third lowest nationwide after the Sahel Region and the Est Region, which constitute the regions most affected by militancy in Burkina Faso, suggesting that if socioeconomic factors are an enabler of jihadist militant activity, the Sud-Ouest is at risk. On November 8, Amadou Kouffa, a Malian militant commander and Emir of Katiba Macina which is part of the JNIM, made his first visual appearance since the group’s establishment in March 2017. In his speech, Kouffa called on Fulani across West Africa and in Cameroon to wage “jihad”. He further greeted “Fulani mujahideen” across the subregion, indicating a militant presence in the areas between Ivory Coast and Mali, and Ivory Coast and Burkina Faso (Jihadology, 2018). This report could strengthen the hypothesis that current developments in the southwestern regions are linked to the regional insurgency in the western Sahel. Many Fulani gravitated southward during the droughts of the early 1970s and integrated into communities in northern Ivory Coast. While Kouffa in his highly ethnicized and regionalized speech addressed the Fulani, the community in Burkina’s southwestern regions remains modest (Boutrais, 1994). The percentage of Fulfulde-speakers does not amount to more than 5.7% in Cascades (Ceped, 2016, p. 42), 2.4% in Sud-Ouest (INSD, 2015, p. 16), and no specific data available for Haut-Bassins, in the statistics clustered with other minority languages in the region (ISSP, 2006, p. 36-37). Relations with indigenous groups have intermittently been complicated, in particular with the Lobi majority. In early 2016, more than 2,000 Fulani were displaced amidst intercommunal violence in the surroundings of Bouna, far north Ivory Coast; many displaced found refuge in southwestern Burkina and neighboring Ghana (Le Monde, 2016). Yet, no evidence points to a link between the current dynamics of conflict and recent insecurity, or that the Fulani community is susceptible to Kouffa’s call. 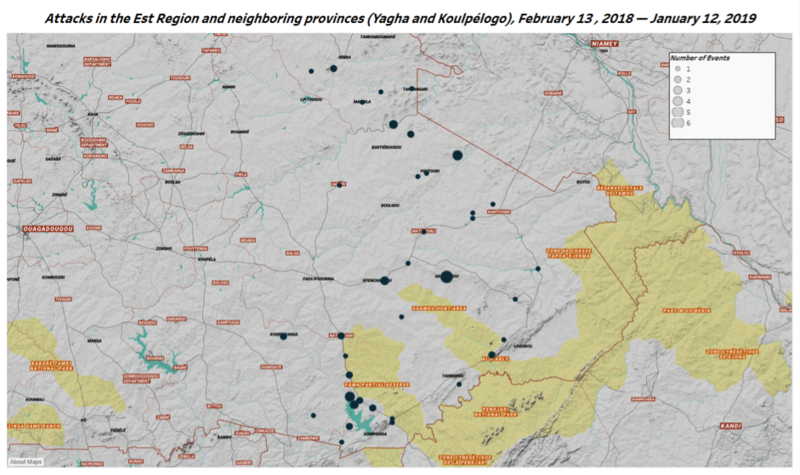 Indeed, the militancy in the subregion is composed of heterogeneous groups: the members of the jihadist network in the area concerned include individuals from the Mossi, Senoufo, Soninké, and Bobo communities, amongst others. The regions of Sud-Ouest and Cascades have previously remained untouched by militancy; however, the first armed assault in Burkina Faso attributed to Islamist militants took place in Samorogouan in the region of Haut-Bassins. In mid-2015, Ansar Dine’s Katiba Khalid ibn al-Walid implanted itself on the border between Mali and Ivory Coast; the group also established a base in the Sama forest and in June that same year it carried out and claimed responsibility for two attacks in the villages of Fakola and Misseni, in Mali’s Sikasso Region (Al Akhbar, 2015). During the months that followed, it was reportedly dismantled by Malian forces (Jeune Afrique, 2015) and Ivorian Dozos (Mali Actu, 2015). Militants part of Katiba Khalid ibn al-Walid or closely linked to the group in the Sama forest (Yahoo, 2016) were those who in October 2015 carried out the attack in Samorogouan on the Burkinabe side of the border (RFI, 2015) (see map below). The leader of the group, Boubacar Sawadogo, was integral in establishing a branch of Ansar Dine in Burkina Faso—a group which could be viewed as a precursor of Ansaroul Islam. Boubacar’s younger brother, Abdoulaye Sawadogo, one of the core members of the Samorogouan cell would reappear in May 2018 (Courrier Confidentiel, 2018), amidst a counter-terrorism operation in Ouagadougou, killed alongside two associates with a third arrested (Le Faso, 2018). The operation occurred in the wake of a major double-attack in early March that targeted the French Embassy and the headquarters of Burkina’s armed forces in the capital of Ouagadougou (RFI, 2018). French technical support played a central role in tracking down the cell. The analysis of a phone recovered from one of the French embassy attackers enabled the surveillance of the Ouagadougou cell (Jeune Afrique, 2018). Supreme Court prosecutor, Maïza Sérémé, identified the cell as being one of the groups constituting the JNIM, Al-Mourabitoun (Le Faso, 2018). On December 6, 2018, Malian intelligence dismantled a militant cell near Koutiala (Le Figaro, 2018) (see map below) which allegedly intended to carry out attacks in three West African cities including Abidjan, Bamako, and Ouagadougou on New Year’s Eve. The militants included four men composed of two Burkinabe brothers, an Ivorian, and a Malian. Adama Konaté, one of the Burkinabe brothers was named as the leader of the cell, likewise the successor of Abdoulaye Sawadogo who headed the aforementioned Ouagadougou cell, but also described as the “focal point” or coordinator between militants in the tri-state border area of Mali, Burkina Faso, and Ivory Coast (Essor, 2018). Konate´s brother, Kassim, had reportedly scouted the Ivorian army headquarters and a “stylish” hotel as potential targets (RFI, 2018). It was further stated that the cell participated in the aforementioned double-attack in Ouagadougou (Jeune Afrique, 2018), reportedly in the capacity of providing logistics and conducting recruitment (RFI, 2018), and also involved the abduction of a Colombian nun in Karangasso. The dismantling of the Koutiala cell was likely an extension of the efforts that previously led to the neutralization of the Ouagadougou cell, as the result of tripartite cooperation between Burkina Faso, France, and Mali. On December 15, 2018, an Italian and a Canadian went missing in Burkina Faso while on a road trip to Togo; they were last seen in Bobo-Dioulasso (Corriere, 2019) and the Canadian authorities treat the case as an abduction (RCI, 2019) (see map below). If the abduction of the couple is confirmed, there is a high probability that JNIM militants would be the culprits—or criminal networks linked to the group. 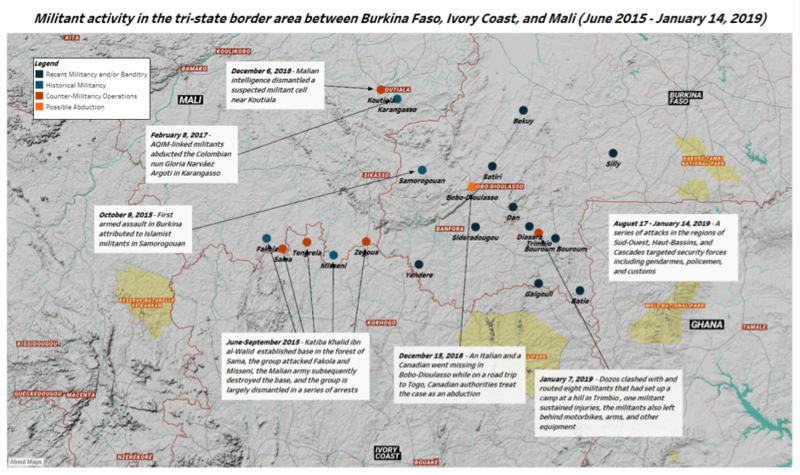 To summarize, there has been a continued presence of militants in the tri-state border area since 2015 with intermittent activity linked to the same multinational network of militants comprised of Burkinabe, Malian, and a few Ivorian nationals. Whether attributed to the name Ansar Dine or Al-Mourabitoun, it is part of the historical AQIM-network that represents the main force driving the regional insurgency in the Western Sahel, now under the JNIM label. It has also been shown that this group constitutes an important component of the militant organization’s regional operations. Another significant continuity is that the issue of Khalid ibn al-Walid never was completely solved; rather, the group hibernated for extended periods. The group has probably consorted with criminal networks in order to bolster its ranks and resume activity.